During Storybook or Fairy Tale photo shoots, kids dress up in shimmering fairy or fierce knight costumes and strike mystical poses. Afterward, families will view the results and select the pose they like best to be printed and turned into a digital image. 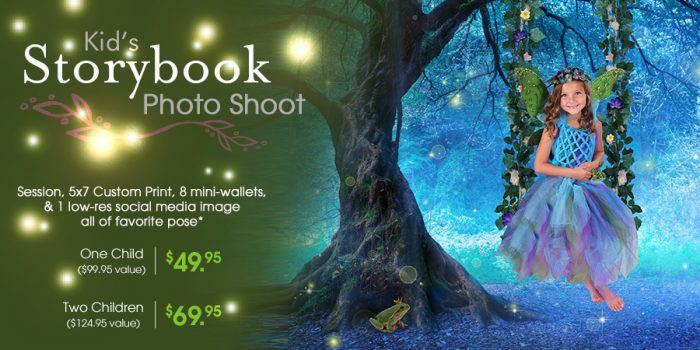 Our talented graphic artists will then add a digital background and magical effects to the chosen pose, creating an otherworldly forest scene (Storybook wardrobe varies by location so we encourage clients to bring their own, as well). *Ages 1-12. Limit one special per customer or family during each promotional period please. Child appropriate makeovers available for an additional fee. Offer not valid for groups or parties. In-studio only. Customers under 18 must be accompanied by a legal guardian. All services must be redeemed during 1 visit and must be used by same customer. Not valid for existing orders, reprints, enhancements, or special orders. Shipping & handling may apply. May be used on any type of kid's session. Deal is of 1 pose only. Additional package options available day of session. Due to high appointment volumes at many of our locations you may be contacted for a refundable reservation fee to secure your appointment date and time. If you need to cancel your appointment, the reservation fee will be refunded if it is canceled at least 48 hours before your scheduled appointment time. Storybook wardrobe varies by location.